Charlie Austin has been banned by the FA for his two-fingered gesture towards Manchester City fans. 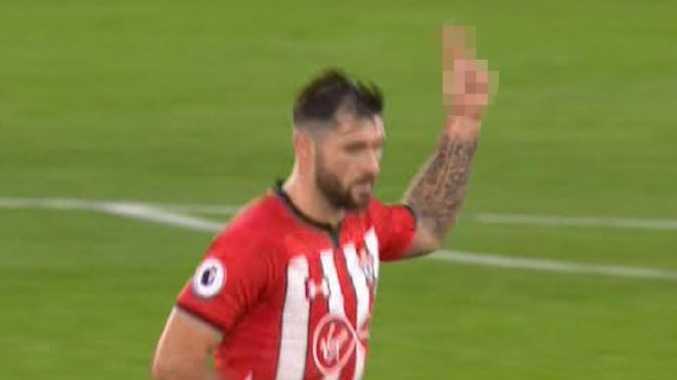 SOUTHAMPTON striker Charlie Austin has been given a two-match suspension by the Football Association after making an offensive gesture to Manchester City fans last month. The 29-year-old was charged by the FA for his actions after he was substituted during Southampton's 3-1 loss at St Mary's on December 30. Having admitted to the FA charge in relation to the gesture, he will miss the Saints' Premier League clash with Leicester and their FA Cup replay against Derby. Austin, who received a yellow card for a foul 10 minutes before he was replaced, played in Southampton's past four matches in all competitions. He has scored three goals for the Saints this season. His absence adds to manager Ralph Hasenhuttl's problems in attack, with Danny Ings and Michael Obafemi both set to miss the clash against Leicester with hamstring injuries. Watford striker Troy Deeney has also been charged following comments he made about referee David Coote after his team's 3-3 draw with Bournemouth on January 2. Deeney was critical of Coote's performance in the Premier League clash and claimed in a BBC post-match interview the official had "bottled it on a few occasions".